Bed & breakfast La Ferme de Pauroux is situated in the Drôme at Mornans, halfway between the two villages Saoû (6 km) and Bourdeaux (4 km). At the other side of the road you find at the border of the property, the river the Roubion with lovely spots to swim, play and relax. If you do not know the Drôme region you will be pleasantly surprised. Below you will find some information about the region. In our dining room you will find more tourist information. Upon arrival you will receive a map of the Drôme and we will inform you with pleasure about the main attractions in the area. Bourdeaux is a lovely village with beautiful castle ruins. The weekly market attracts a lot of locals and tourists. La Ferme de Pauroux is the start of a beautiful hikingtrail about 6 kilometers, through the hills, to Bourdeaux. The forest of Saoû is a beautiful area with lots of trees. There are many hiking trails in different levels. The highest mountain is Le Veyou of ‘Les Trois Becs’ 1589m. Beautiful picnic areas and a large meadow. Also a unique place for rock climbing (many levels). The forest of Saou consists of mountains that form a closed bowl. ‘Les Villages Perchés’ are several villages all situated up the hill near a castle. At the tourist offices you can find itineraries by car and bike to visit them. The nearest tour is ‘Les Pays de Saoû et de Bourdeaux’. In total there are four different itineraries available. They also have information on hiking trails. North of Mornans, about 20 minutes away you find Crest. Crest is known for it’s medieval citycentre and narrow streets. Crest also boosts the highest medieval tower in France of 52 meters. 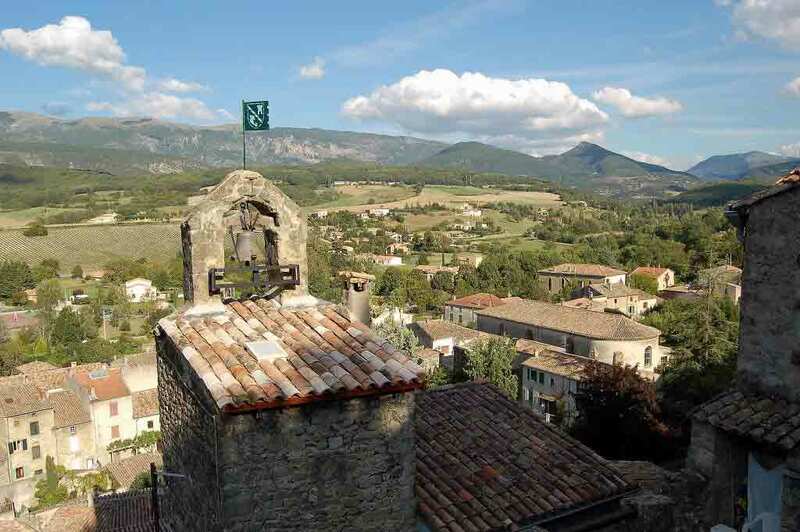 From the tower you can see the Drôme streaming through the heart of this ancient village. There is a weekly market and in the summer there is also a ‘marché nocturne’, an evening market where you can buy and taste regional products and dishes such as the aperitif wine Clarette de Die and delicious goat cheese like the Picodon. Dieulefit is also at 20 minutes distance from Mornans, but to the south. Just like Crest it is a village with pleasant small roads and local markets. 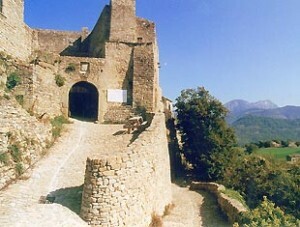 Dieulefit is the gateway to the Drôme Provençale. Besides the typical villages, nature has a lot to offer, like the natural reserve ‘Des Ramieres’ along the banks of the river the Drôme. The cliffs of Omblèze are impressive with a waterfall of 72m. 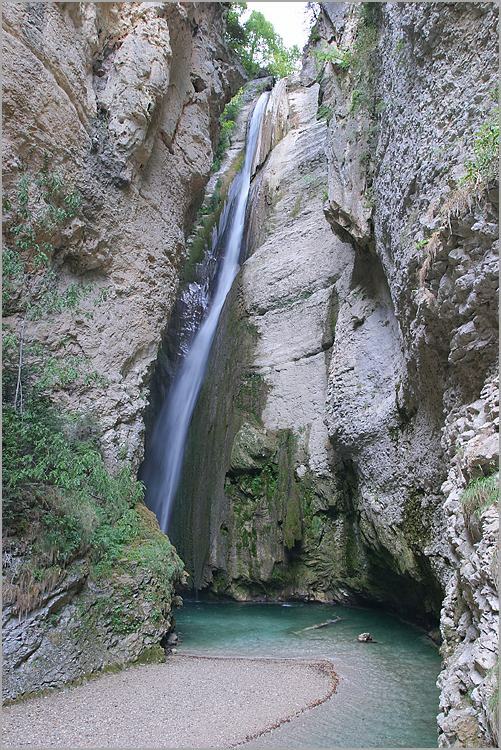 A hiking trail along the waterfall brings you to the river and a beautiful spot to play and swim. 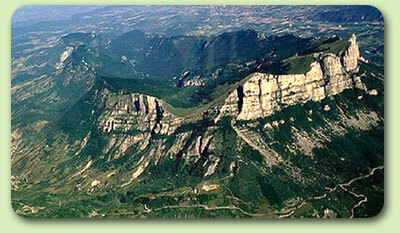 More to the north you find the Vercors with spectacular cliffs and cleaves, which are really worth to visit. From the end of June untill half of August the lavendel flourishes. We have different itineraries available along lavender fields. 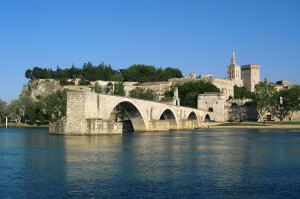 Besides the villages there are also cities which are worth visiting. Montelimar the city of nougat is at about 40 minutes, Valence at one hour and Avignon with the well known bridge from Avignon is at 1,5 hour distance.